A Romp through the Universe! Join Astronomer Richard Darn for a fabulous voyage through the Universe along with stargazing experts who will bring along powerful telescopes and space rocks four billion years old! 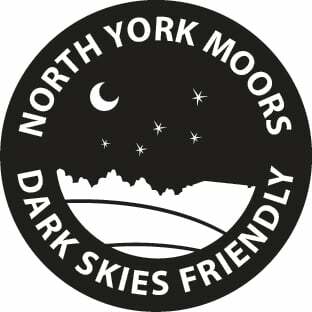 Cropton Forest is one of the darkest spots in the North York Moors so prepare to be wowed by the sight of thousands of stars, sparkling clusters and distant galaxies. There'll also be a colourful beginner's talk indoors and chance to get the measure of the solar system using a toilet roll! Suitable for adults and children over six years old. Goes ahead whatever the weather. The below graphic shows if and when it will be dark at Cropton Cabins Holiday Park on the evening of this event. Yellow areas show when the skies are not dark due to daylight (bold yellow) and moonlight (faded yellow). Click on the image for an explanation on how darkness is determined.